Happy Kitchen Sink Stamps Monday, I'm so glad you stopped by today! I've had some wonderful company the last few days, so you might notice that my color theme is being repeated in today's post, as I haven't quite cleaned up my studio! 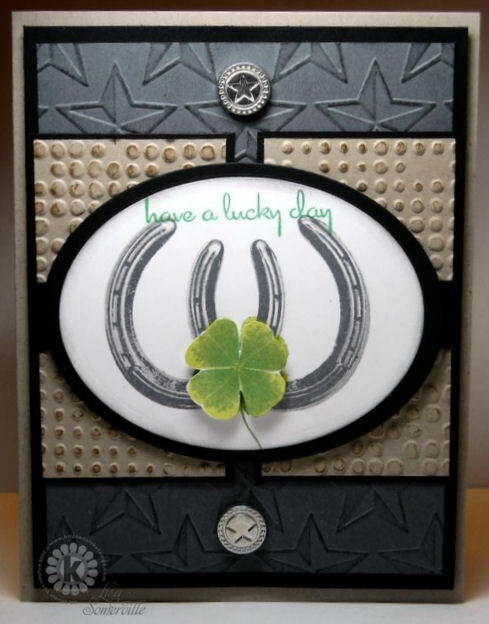 I used Kitchen Sink Stamps Multi Step Shamrocks & Clovers, Multi Step Lucky Horseshoe and Ready for any Holiday to create today's card. Color inspiration came from PDCC#39 (except I added a touch of green - have you ever seen a gray shamrock? ), sketch inspiration is from Jen's SFYTT, I flipped the sketch to work with my image. The Shamrock and Horseshoe set both have mini color recipes included with them - so I used those as my jumping point for colors - how much easier can that be! I added texture to my panels using the CuttleBug Stars and Texture Fades Dot folders, then added color using the Cuttlebug Highlights technique to create some depth. Have a creative week! I'm taking two classes tomorrow at CHA, and will be driving back and forth during the week to the Trade Show. If you're planning on going to the SuperShow on Friday, drop me a comment, I'd love to meet you! Wow! Fabulous card! Love all the textures you used! Killer job with the sketch and color combo! Such a great card! Love the horseshoes with the clover and the color combo compliments them well. Yet another fabulous card. No, only green shamrocks! Sure is a great "good luck" card! Wonderful! 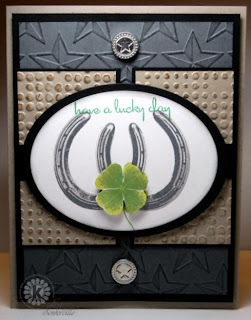 What fabulous textures and great layout for this wonderful card,Lisa!! Love that popped up shamrock!! Awesome work!! That's a beautiful interpretation of the PDCC challenge colors!! I am going to have to check out KSS... thanks for the links! Beautiful design and colors, Lisa! The horseshoes and clover are super fantastic! The embossed backgrounds look fabulous too. This is such a wonderful card, Lisa! 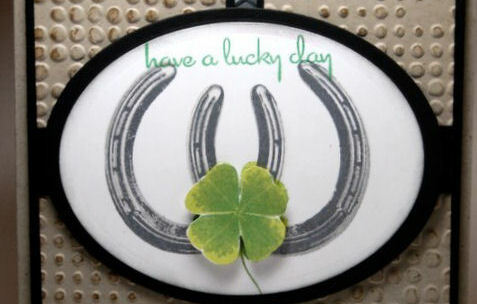 Love the combo of the horseshoes and the clover! what an awesome color combo...wish I had time to play this week..love what you did with all the embossing folders...and stamps..truly a charming piece..pun!!! You sure can make horseshoes look fabulous. Great combination of images. Beautiful.